If you do not mind a few blemishes in the plastic, this is the best buy. If showing out of stock, check back from time to time. This feeder carries the same 1-year warranty as any other Super Feeder. The analog ACAT-32 timer and ACDT-35 digital timer we sell are perfect and guaranteed to work with the outdoor power supply if you do not have a suitable timer. A discounted combo pack is also available on this store. Best Auto Feeder on the market! 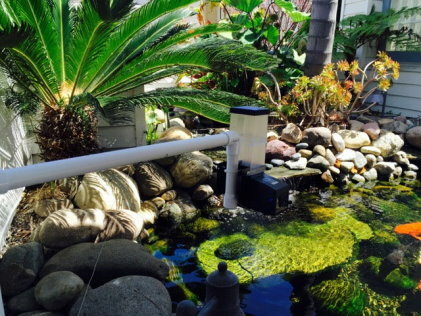 I purchased my first Koi-Pond Super Feeder in May 2006, and I love it as much as I did when I first set it up; actually, more so when I realized how consistently it operated, year after year. For 11 years, it has given me flawless service. Every fall I remove it from my pond and store it in the garage. In the spring I re-install it, re-set the ac-clock timer, plug it all in, cover it to protect it from rain, and it works perfect. I am still impressed with the stability and solid build of this great machine. I bought additional hopper extensions (total four) that enable a month or so of feeding before it needs refilling. This is a great product - excellent quality and dependability. So great, I bought another one! Thanks for making my daily life and vacation planning easier for me and my koi.